Welcome to the TRS (Essex) Ltd Bentwaters Stages 2010. 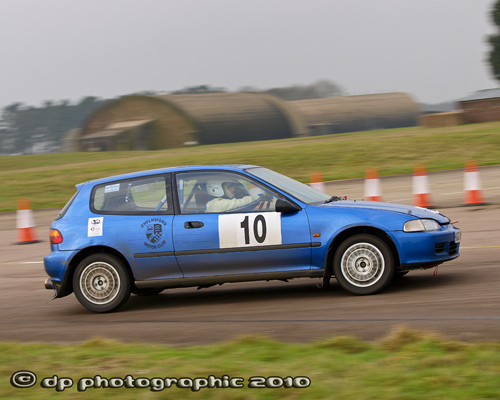 Following Chelmsford Motor Club’s successful use of Bentwaters airfield for a club gymkhana and championship endurance rally earlier in 2009 we are able to announce a Stage Rally at the venue on Sunday 24th January 2010. The airfield has a more open nature than Woodbridge, which combined with the technical areas of the stage should make for an interesting challenge. There will be six stages totalling approximately 55 miles and tyre wear should not be an issue given the time of year we are running. In fact one of the reasons for choosing this date is that statistically it is the weekend most likely to produce snow in the south east of England! A big thanks to John Conboy of TRS (Essex) Ltd for his generous support of the rally, you may recognise his name as Chief Marshal on the Hutton Kitchens Woodbridge Stages and Equipment Officer here. If you need an oil tank, he is your man. Scrutineering will be available on Saturday afternoon at the Holiday Inn, Ipswich (01473 786741 reference CM2) and rooms are available at £55 Bed and Breakfast for those wishing to stay overnight.